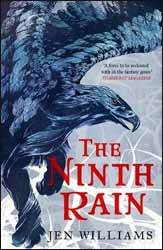 The Ninth Rain (2017. 532 pages) is the first of a new trilogy by Jen Williams (The Copper Cat trilogy), which she has set on a brand-new world of science and magic. I liked The Copper Cat trilogy and so had high hopes for Williams’s new book. She has not disappointed. We follow three primary characters who eventually meet up about a quarter into the story. Tormalin the Oathless is an Eborian, with his height, strength and grace he is analogist to elves, although he is never referred to as such. The fact that he drinks human blood for sustenance adds a layer of vampire to the character. At the start of the book he leaves Ebora, not willing to wait until the blood sickness comes for him, killing him slowly. He heads off into the wider, more dangerous world. Lady Vincenza ‘Vintage’ de Grazon is a wealthy owner of a winery, renowned for its fine wines whose vineyard is being encroached by the spreading pestilence left over from the last invasion. Partially to find a cure and partially because Vintage has adventure in her soul, she leaves the vineyard to try and find out what the pestilence is and how to stop it. Our last companion, Fell-Noon, is incarcerated in a dungeon by religious zealots who believe that her ability to create and manipulate fell fire makes her evil. Following a dream which foretells the return of the Jure’lia she escapes her enslavers and flees to the wild, where the three meet up. One of the impressive things that Williams can do is create believable character who the reader wants to follow. They are not perfect and it is their collective flaws which often adds humour to the novel. There is a lot to like about the story. It would be easy to say that there are many well-known tropes in the book, but Williams adds her own spin on them to make them feel fresh and whilst this is a fantasy novel she has not felt the need to regurgitate the normal faux medieval drivel which seem to fill most other unimaginative books. The book contains both technology, steam trains fuelled by fell witches and a back story which is more science fiction than it is fairy-tale. She also, thankfully, eschews the temptation to rename every object in the world so that you feel like your drudge-like learning a new language which adds little to the narrative except to put distance between author and reader. There are a few new names, but these are mostly restricted to people and place, thankfully trees and wine are still trees and wine in Ebora. The book is nicely paced and although I hate the term, it really is a page turner and I look forward to reading the next two books in the series.